I found this old case that fits my K1000 today at a flea market for $5. It was seriously dried out and looked pretty lousy. I got home and went to rubbing it down with Black Rock leather conditioner. I'm amazed at how well it turned out. I wish I had taken a before photo. I see quite a few of these cases, but not always both pieces. Usually just the bottom half. I now want to find them for my MX, Spotmatics, and ME Super. All in all, I think it was a pretty good score. Last edited by Pentax Syntax; 01-24-2019 at 06:10 PM. Dumb of me not to get a before photo. I almost didn't buy it, considering how scuffed and dry it was, and also, I wasn't sure WHICH camera it would fit. I've used Black Rock on all my leather goods. It's pretty much a miracle product. I now want to find them for my MX, Spotmatics, and ME Super. You won't have as much luck rescuing the later field cases for the M bodies.They're more like painted cardboard.Once they start flaking,they're pretty much done for. While I have switched to neoprene cases for my digital cameras I try to find leather for my film cameras. I still shoot the ME, Zx5n and Pz-1p. They are beautiful and practical. Yours worked out nicely! Some good off-brand generic cases were made for ME/ME Super etc. In this case they were far superior to those marketed by Pentax. Good seller. If they don't have a current listing for this item they will usually be glad to re-list if you intend to buy. I bought that case from Pacific Rim Camera - it was listed as a case for an ME super, but I knew it would fit my Super Program. I had an original case for the Super Program, but as was mentioned above the original Pentax cases of that era disintegrate with time. The aftermarket case is very nice and is not disintegrating. What case fits the ZX5n - one of the cases for the Spotmatic line? I'm glad someone bought one of those, and glad I could help. Pacific Rim Camera is a good honest dealer; I've used them for close to 20 years. 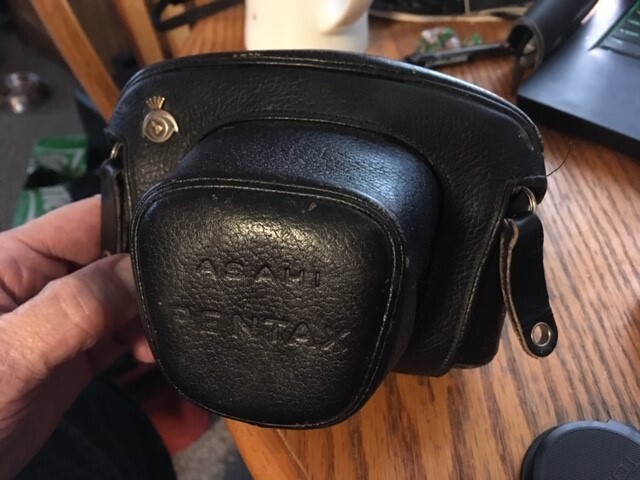 I can't recall ever coming across a generic or "universal" case that fits any of the Pentax AF models. Yes, I've purchased several times from Pacific Rim, great vendor. My most recent - a box of 10 Kodak Snap-caps, NOS. I've seen the link you attached and have been watching for the cases they mentioned, but never seen any.